Back in September 2016, I wrote this post "Pre-StageSVM-DR Relation pre 7 to C Cutover", that was for ONTAP 8.3.2 and it was fiddly to say the least. Ever since ONTAP 9.0 you needn’t go to all that trouble. 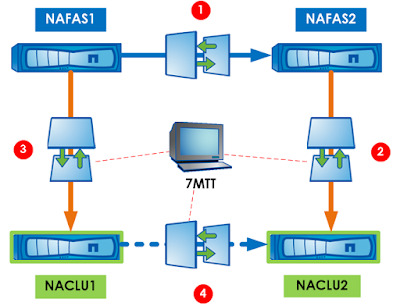 (1) We start with volumes being asynchronously snapmirrored from source to destination. Note: If you have a vFiler DR configuration, this must be deleted since 7MTT does not support this (you will need to re-create the volume snapmirrors but no re-baseline is involved). (2) Create a 7MTT secondary transition project that will coordinate snapmirror of volumes from DR 7-Mode to DR ONTAP. (4) Cutover DR and then production with 7MTT, 7MTT will re-establish snapmirrors from Production ONTAP to DR ONTAP. (5) Once cutover, you can create an SVM-DR relationship. 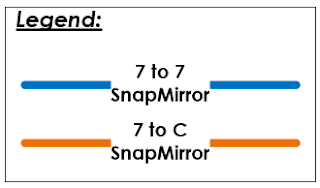 Note: If you want to avoid re-copies over the network, you need to cut over all the required volumes in one go, since once the you have an SVM-DR relationship you cannot 7 to C snapmirror to the disaster recovery SVM. The simple diagram below illustrates steps 1 to 4.